"They were found in the graveyard, springing from the decaying bodies of the women deep in the ground, and they were found in the woods, spreading themselves like a rug over the wet earth. The Beauty were small at first but they grew and took the best qualities of the dead. They sucked up through the soil all the softness, serenity, hope, and happiness of womankind. They made themselves into a new form, a new north, shaped from the clay of the world and designed only to bring pleasure to man. It is not intuitive to seek beauty in art deemed grotesque/weird, but most authors who produce horror/fantasy actually are usually (a) serious about their craft, and (b) driven my strange muses. These interviews engage contemporary authors & artists on the theme of "Art & Beauty in Weird/Fantasy Fiction." Aliya Whiteley has written over thirty novellas and short stories in a range of genres. 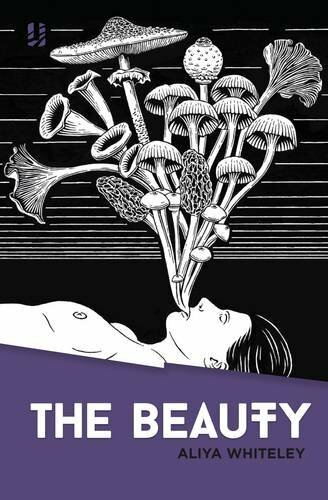 Her excellent novella The Beauty offers a compact dose of weird fiction in which humanity is evolving into mushrooms. It is entirely unique, but could be described as a mashup of Kafka’s body horror (The Metamorphosis), Golding's social dynamics (Lord of the Flies), and James' infertile dystopia (The Children of Men). 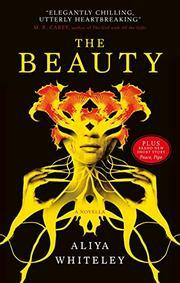 “The Beauty” is an action-packed tale saturated with philosophy on "what is beautiful?" and "what is humanity? ", a true must-read for those who enjoy intellectual meat (shrooms?) with their adventure fiction. Let’s learn more about Aliya Whiteley and her muses. SEL: You were born in and raised in southern England. Are there fungal horrors in the sea-side town of Ilfracombe that haunt you? Perhaps, you have a different muse from the area. AW: I don’t remember finding many mushrooms in Ilfracombe, but certainly I grew up feeling that it was filled with strange events, from a ghost in a decaying hotel to the tall, triffid-like plants that grew in an old explorer’s garden. These things have appeared many times in my fiction, and I’m still writing about it now. The Beauty is set in the Valley of the Rocks, which is a real place close to Ilfracombe with an almost volcanic landscape; it’s a few miles from where I grew up, and I remember visiting it and feeling that its bare, rocky ground was more suited to a horror story than any romantic tale (the most famous novel set in that area is RD Blackmore’s Lorna Doone: A Romance of Exmoor, first published in 1869). Spooky things always seemed to happen in Devon – but perhaps that’s down to my teenage imagination, which liked to find monsters and darkness in every situation. SEL: Early weird fiction masters like Edgar Allen Poe, Clark Ashton Smith, and Howard Phillips Lovecraft wrote letters and essays on “Beauty,” and they all generally espouse that beauty is not necessarily within art (i.e., a book or poem), but it is the conveyance of a feeling. Is there beauty in horror/weird fiction? Is there beauty in the repulsive? AW: These are the kind of questions I think about a lot, and haven’t found any answers for! I suspect that beauty is one of the really big concepts in human existence that deserves a lot of interrogation. What is it? When and how does it come into existence? Does something have to be universally considered beautiful to deserve the description? If one person finds it hideous, does it forfeit that idea? Perhaps everyone has different thoughts about this area, as well as having different definitions of beauty. There’s a moment in The Beauty where the narrator, Nate, comes across a glossy women’s magazine from a time before the death of all women. He doesn’t recognize the pouting figure on the front cover as beautiful because that stylized version of beauty has now disappeared from the world. Nathan then goes on to find things that we would consider grotesque, even horrifying, to be beautiful. It’s all connected to his perception of what life is about. He finds beauty in growth and change. I wonder if uncovering our own personal ideals of beauty rests somewhere in better understanding the concepts that underpin it. So, on those terms: yes! There can be beauty and horror in many things, simultaneously, including weird fiction. SEL: Do you find “The Beauty” repulsive, beautiful, or both? SEL: Do you eat mushrooms? AW: I eat lots of mushrooms, and I’m a bit perturbed when people tell me that I’ve put them off mushrooms! I love them. I make a brilliant mushroom stew with cheese and walnut dumplings. Although I have occasionally found non-edible mushrooms when walking my dog in the nearby forest and felt a bit disturbed by them, if I’m honest. Particularly if they’re yellow and strangely solid, or growing in large clumps to take on monstrous shapes. They are fascinating, aren’t they? I remember reading an article about the mass extinctions of life that have taken place on Earth, and how fungus thrives afterwards, with so much decaying matter to feast upon. I think that must have been lurking in the back of my mind when I started writing the book. SEL: Your body of work is eclectic, so you seem to defy the limitations of a single genre. What are our muses then? Where do you “fit”? AW: I don’t think about fitting anywhere, really. I’m very interested in exploring genre, so many of my books have horror, science fiction, crime or fantasy elements mixed in with commercial or literary approaches to prose. Another way of putting it might be to say that I like to write whatever I want to write, and let other people worry about the definitions when they’re trying to sell it or explain it. That suits me fine. 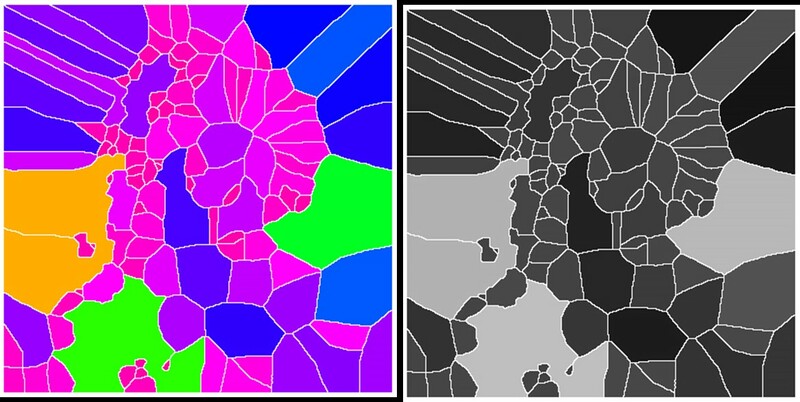 SEL: Voronoi / Rorschach test: What do you see? Ok, bear with me since this is question a game/gimmick of sorts, but it may be fun. 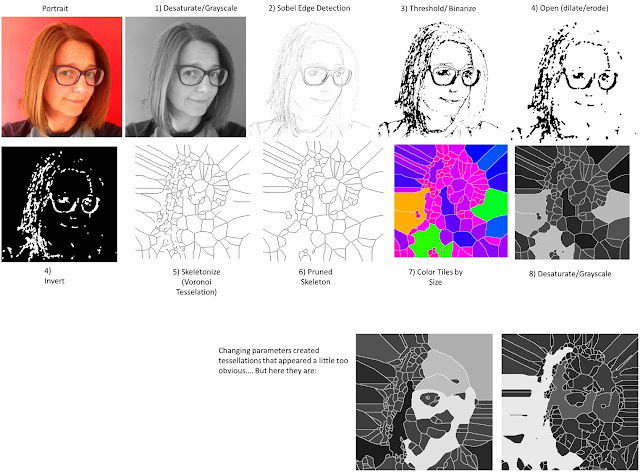 I wanted to reinforce your “fitting-in” tessellation-metaphor in a fun way. As a scientist who performs image analysis on data, I apply tessellations on photos to quantify things like particle size, or effective densities of microstructures. 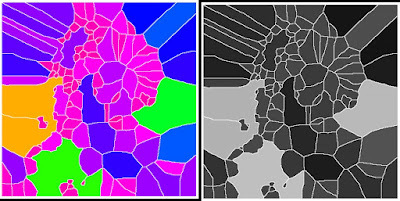 I took the liberty of using some Voronoi methods (typically applied on images of dispersed points) on an image you should be familiar with (I grabbed it online). Figured it would be interesting if you commented or interpreted this abstract version, and described what you see. There is no intention for any real psychological test, but this exercise may also reinforce your feelings on different perspectives. AW: My first thought was that I was looking at a map of some strange outcropping of land, surrounded by psychedelic seas. It looks like my kind of place! I bet they tell good stories there… My brain also wants to turn it into a sideways view of a face, perhaps a child’s face, with an upturned nose and a chin resting on one finger. Lost in thought. Can an image be a map and a person? And a mushroom, of course. SEL: Love of Language: “The Beauty” and “Peace, Pipe” (provided as a pair in the 2018 edition) both had protagonists with storytelling/journalistic roles which affected greater society. Given your degrees in Theatre, Film and Television Studies. any other media Other Arts, you clearly like the subject matter. Your prose is rhythmic and begs to be read aloud like poetry. Explicitly having your characters take on your persona seems telling. What about language and storytelling compels you so? AW: You’re right that I was influenced by theatre first, and started out by writing stage plays before deciding to switch to novels. It was all about the concept of voice. A lot of my writing is in first person for that reason. I love being able to capture and sustain a person’s voice, and I haven’t found any form that allows me to do that so completely as the novel/novella/short story. It can be an immersion into somebody else’s head, for the writer and the reader, and I find that so powerful. Also, the subjectivity of it is so involving. The Beauty was so much fun to write because nobody viewed these mushroom creatures in the same way, and therefore refused to accept them into their own narrative in the way that the storyteller figure wanted to present them. There’s such great tension in that. Which story do we choose to accept about our own pasts and futures? We’re all telling stories and perfecting our own voices all the time by subtly rewriting our own experiences and feelings. That was brilliant territory to explore. SEL: Beauty and attraction need not be about gender roles, but sexual attraction certainly involves beauty. There are no women in The Beauty, so you literally switched gender-perspective to write on behalf of your characters. You could have reversed the situation and had all the men die instead. Please discuss the creative process while switching gender voices, and the role of beauty in relationships. AW: I don’t plan in advance. I sit down with my notebook and pen and start putting words down on paper. I’d just finished writing a novel with a female protagonist that had a repressed, strict tone to it and so I picked up a fresh notebook and started writing and the first paragraphs of The Beauty, in Nate’s voice, came out. I loved his voice straight away, and I kept going, really enjoying the freedom to let the words flow. As I started to get a sense of what the story was about I was nervous about the subject matter and getting the voice right but early on in the process the thought came to me that Nate could barely remember a world without women, so he wasn’t going to hold a lot of set viewpoints about gender. That helped me to let go of the idea that I had to write a man. I wrote a person trying to make sense of new things, changing things, and finding beauty by embracing those changes. I think it’s really interesting to consider how the book may have been different if I’d imagined all the men dying and the women being left behind. What decisions would they make differently, as individuals, as a group? But Nate’s voice cropped up first, and that’s the voice, and the story, I told. Maybe I’ll try it the other way around some time. SEL: Can you recommend past and/or future works of yours that would appeal to the weird-fiction crowd? AW: For US readers, my novella The Arrival of Missives will be published by Titan in November 2018. That’s another story which uses the natural world in surprising ways and doesn’t belong to one genre. It’s set in England in 1920, and begins as a coming of age story about a girl who adores her teacher, and becomes – I don’t know, maybe science fiction? The Arrival of Missives is already available in the UK from Unsung Stories. For UK readers, my new novel The Loosening Skin will be published in October 2018 by Unsung Stories, and that contains similar elements of body horror, but intermingled with a detective story and an examination of love in much the same way as The Beauty examines our concepts of beauty. Thanks for the opportunity to give these novels a mention, and to chat about The Beauty! I enjoyed it. SEL: Thank you for writing intellectual fantasy and sharing your creative process! Readers can learn more about her Wordpress. SEL: After the interview, I provided the below Image Analysis workflow that transformed her portrait into the abstract tile. What did she see in herself? Aliya Whiteley was born in Barnstaple, North Devon, in 1974 and grew up in the seaside town of Ilfracombe which formed the inspiration for many of her stories and novels. She was educated at Ilfracombe College and gained a 2:1 BA (Hons) degree in Theatre, Film and Television Studies from the University of Wales, Aberystwyth in 1995. In 2011 she was awarded an MSc in Library and Information Management by the University of Northumbria; her dissertation involved conducting a case study into the research techniques of modern novelists. She currently lives in West Sussex.